This is the first game in the Guilty Gear series. 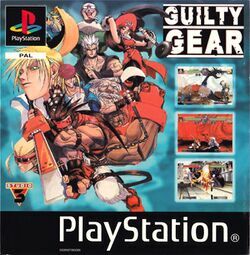 For other games in the series see the Guilty Gear category. Guilty Gear (ギルティギア, Giruti Gia?) subtitled The Missing Link in Japan, is the first game of the Guilty Gear series developed by Arc System Works. It was first released on the PlayStation in 1998 and later on the PlayStation Network in 2007. Despite being the first release of the Guilty Gear franchise, the game itself reveals little of its past storyline; it is not until later releases of the video games, drama CDs, and novels of the franchise that its history is thoroughly explained. Guilty Gear is set in 2D, similar to Street Fighter and The King of Fighters, but is fast-paced and focuses more on the use of combo techniques. The game features 10 characters and three hidden characters. It uses a six-button layout: Punch, Kick, Slash, H-Slash, Dust and Respect. Combat is one-on-one set in best-two-out-of-three rounds. It uses a "tension" gauge, akin to Street Fighter Alpha's Super Combo techniques, in which characters can input certain commands and activate special-moves called Chaos Attacks. It also features an air-combo system, comparable to Marvel vs. Capcom's "Aerial Rave", allowing combos to be performed on airborne opponents. Guilty Gear features instant kill techniques called Destroy Attacks, that can be activated after a Murder Outbreak attack successfully lands on an opponent, effectively ending the match. The game also has a feature called Chaos Mode that is activated when a character's health is at the half-way point (yellow bar). A red aura will surround the character and he/she is able to perform unlimited Chaos Attacks. This page was last edited on 16 December 2012, at 21:56.